Like many Native American arts and crafts, the traditional corn husk masks are becoming more difficult to obtain with each passing year. Occasionally, I find a few for sale at either the Six Nations Reservation in Ontario or at The Kahnawake Mohawk Reservation south of Montreal. When I do, I buy every one I can get. These masks have not been blessed or used in religious ceremonies. Click HERE for information on the controversy regarding the display and sale of Iroquois False Face Masks. Our Gxx codes denote individual pieces. 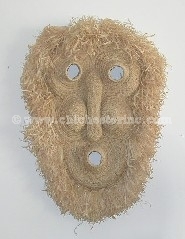 If you would like to order a specific mask, please go to our Gallery to pick the exact one shown. 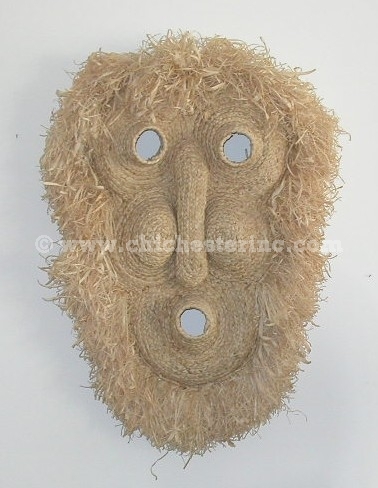 The full-size corn husk masks are generally big enough to wear. The faces are between 7.5" and 8" long and 5 to 5.5" wide. With the husk trim, the overall size varies between about 19" to 21" long and 15" to 16" wide.